Deveneys of Dundrum: Chapeau Pineapple..... Amazing. Evelyn, Julie, Lou and myself stopped into the Bull and Castle after work on Saturday for 2 reasons - one of which we were a week early for and the second was a cold bottle of Chapeau Kriek. Unfortunately we got sitting beside a man who was eating some girls ear but apart from that the Chapeau was delicious. I had a sample bottle of Chapeau Pineapple in my fridge - which I had been saving for a week. It pours a golden honey colour with a slightly syrupy consistency. The nose is citrusy, biscuity and laced with fresh pineapple. The palate was sweet but not sickly with loads of clean pineapple flavours and a lovely acidity on the finish. Slightly carbonated and by far the nicest Lambic I've tried. I have 5c/s on order. 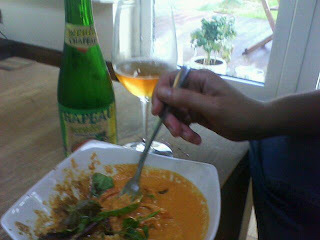 This we had with Clare's Curry and it was a much nicer alternative to Cobra/Sol. An ideal accompaniment to spicy Indian or Asian food. The palate was weighty enough to hold up against Lisa's homegrown red chillies. Best Tuesday dinner to date. Chapeau Kriek available at Deveney's Dundrum €3.99 bt. Chapeau Pineapple enroute from Belgium. Gonna grab a bottle or two of that Kriek tonight. And some more Jaques as well. The Chapeau Kriek is lovely- a little girlier than the Boon though. Thats why I love it!! Ah glad the chillies went down well! !